I love a good sideshow gaff, and the Pyewackett and Pecke site has posted a rare treat: Build notes and photos for a great-looking FeeJee Mermaid prop. Artist Dan Baines has a five-part series of posts detailing the prop: Part 1, Part 2, Part 3, Part 4, Part 5. Some of his techniques and materials are probably out of range of the average home DIY-er: The mermaid’s claws, for instance, are made from 3D-printed bird feet, and Baines made a custom silicon-rubber texturizer to create the impression of scales. However, there are other, less esoteric, ways to achieve similar effects: Replica animal claws are available at places like The Evolution Store, you can use claw-looking things like dentalium shells, or you can simply mold the things individually out of polymer clay. Instead of clawed fingers, it might be interesting to give the mermaid webbed hands instead; in that case, the model duck feet used for taxidermy would look great. For the front half of the mermaid Baines used an 18″ medical skeleton model and a resin cast of a human infant skull. He unfortunately doesn’t specify where he got either; the Skeleton Store has a replica of a full fetal skeleton, but it’s a tad pricey. Their Frugal Fernando seems about the right size for the ribs and arms, and instead of a fetal skull a replica monkey skull might be a cheaper option; after all, the original taxidermied FeeJee Mermaids were made from the front half of a monkey attached to the back half of a fish. This would be a fantastic display piece, and would look great as part of a cabinet of curiosities. The next time you vacation at the beach, be sure to dig around souvenir shops for dried seaweed and similar oceany stuff which could be used either as detailing on the body (feathery kelp might make interesting fins) or to add “carnival exhibit” interest to the display stand. Bonus link: The Propnomicon site has a nice post mortem discussing this build, with further suggestions for materials and techniques more suited to the amateur builder. It’s funny how serendipitously following one link can lead to the discovery of something entirely unrelated here on the ol’ intartubes. Amusingly enough, Seanan McGuire’s book “Sparrow Hill Road” uses those characters in a few stories, in which Laura has become a vengeful professor and ghost Tommy has long since forgiven the main ghost character for not managing to stop him from being an idiot. At which I cocked my head like a quizzical basset hound and discovered that the book was born out of a linked series of short stories that McGuire wrote for online magazine The Edge of Propinquity. The series focuses on Rose Marshall, a hitchhiking ghost seeking revenge on the man originally responsible for her death. I quite like the idea of the old urban legends having deeper, interconnected roots. A while back I found a photo of a barbecue grill housed in a casket and was dismayed because there were no other photos or information about it. Fabulous commenter Fiend4Halloween just pointed me to a version that’s not only much nicer, it also includes build instructions. Check out this awesomeness. The creator is lime3D, a self-described “Inventor for Hire,” who built the grill for tailgating parties with the Nightmare Cruisers Hearse Club. 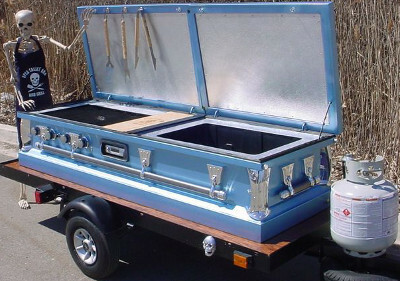 The modified casket and accessories are fairly heavy, so part of the project involved refurbishing a trailer to tow the grill behind his hearse. I would enjoy seeing that driving down the road. The casket mod is really well-done, with half of the interior housing the grill and the other half an insulated cooler. There’s storage space between the two for tools and utensils, and the storage lid doubles as a cutting board. He even installed a radio in the exterior. Now, obviously, this is a project that requires some fairly advanced skills and tools, so it’s beyond the scope of a lot of us DIY types. However, if you’ve got the necessary experience (or can obtain the services of a welder and/or carpenter), this would be an amazing build opportunity. If you aren’t the tailgating type, mount it on a stand in your yard. The maker answers some additional questions in the comments section, such as where to obtain a casket. U.S. law makes it fairly easy to purchase them from a third-party source; Wal-Mart sells them, as does Amazon. If those options aren’t available to you (or are too expensive), check with local funeral homes for damaged products. You’re going to rip out the whole interior anyway, and an exterior dent or two shouldn’t matter much. If you don’t want to bother with the cooler half of the project, a child-size or pet casket (why they make steel caskets for pets is another question entirely) should be significantly cheaper and could house just the grill. Here’s Trent Reznor and Peter Murphy performing Bauhaus’ best-known song. Cross-Stitched Microbes – Etsy shop Wally’s Wall Stuff has some great cross-stitch designs; I particularly like the Wash Your Hands reminder. Our Neighbor’s House – io9 has an exclusive excerpt from Emily Carroll’s horror comic collection Through The Woods. “Rat Queens” to be a Cartoon – I don’t read a lot of comics so I’d never heard of this series, but it sounds pretty awesome. A branch of Peter Jackson’s Weta Workshop is turning it into a cartoon. The Odyssey in Legos – This amazing mega-Lego installation features most of the high points of The Odyssey. Extreme Wine Pairings – Just in case you were wondering whether red or white went better with grasshoppers. Caleb Brown’s Surreal Paintings – Brown depicts a near-future world where humanity is threatened by giant insects and flying sharks. I for one welcome our new otter overlords. Urban Bugs – Splendid “lookbook” of beetles dressed in various fashion brands. Listen to Bats Sing – Wolves aren’t the only children of the night who make music. Leaving a watermelon on someone’s doorstep in the middle of night is a pretty inexpensive way to occupy a portion of their mind forever. But i also think its fkn strange how many ppl bring knives on a date. “Don’t Kid Yourself” would be the greatest brand name for birth control pills. Carefully-written fact-checked essay in the streets, unmoderated comments section in the sheets. My favourite thing about Scooby-Doo is that supernatural events occur and nobody suspects the four out-of-towners with a talking dog. I like how we call them earth worms. It implies that there are also space worms. Friend of the blog Burning Prairie fills her Facebook feed with interesting music. Since she spends so much time ferreting out new artists, I asked her if she’d be willing to share some of her finds with us. Here’s the first in what I hope will be a series of her suggestions. Not to take away from the venerable Goth bands of our youth, but there are a lot of really good artists out there right now. While these newer artists are not tagging themselves as Goth or even darkwave, their music still fits within the Goth aesthetic. One of my current darlings is Chelsea Wolfe. The bio on her website says that her records “transcend time, avoid pigeonholing, and most importantly, allow a glimpse into the soul of a true visionary.” I would agree with this description. “Feral Love,” the first track on her Pain is Beauty album was recently featured in Game of Thrones season 4 trailers. Her original video for this song is as visionary and surreal as the music it accompanies. (in the order I think goes from best to worst.) Even being prepared for it—in the second reading—they’re creeptastic and make me want a wall at my back. I didn’t realize there were more of them (nor that there were English translations), so I researched a little further: I had suspected that “Naver” wasn’t actually the name of the comic, and this is the case; Naver is the name of a popular South Korean search engine which also offers a lot of original content within the same site (sort of like Yahoo). Part of its comics section is devoted to “webtoons,” comics that are either fully animated or enhanced by animation. The three webtoons that so thoroughly creeped xJane (and me) out are by an artist called HORANG; the front page of his/her site seems to indicate that there might be additional comics, but I don’t read Korean so I couldn’t swear to it. Anyway, the examples linked above are like mini-horror movies right in your browser. There are likely many similar ones to be found if you feel like doing a bit of digging; webtoons seem to be particularly popular in South Korea, so both the Naver site and the web portal Daum might be worth trawling for ghosts. And if you can’t sleep tonight, blame xJane. Smoke Gets in Your Eyes: And Other Lessons from the Crematory – Caitlin Doughty, the mortician behind The Order of the Good Death, has a new book discussing her profession. The First Splatter Movies – A look at the Grand Guignol theater (NSFW). St. George’s Church – Locals decided this Medieval church was bad luck and were letting it fall to ruin, so an artist filled it with ghostlike sculptures and turned it into a very cool tourist attraction. History of the Ouija Board – This article is a little heavy on the breathless woo-woo regarding supernatural influence, but it’s an interesting read. It’s particularly amusing to learn that the board was invented as a sort of spiritualism time-saving device. FakeRubberSnakes – I can’t tell you how happy it makes me that there’s a site devoted entirely to fake rubber snakes. Guide to Troubled Birds – A pocket field guide which allows one to “quickly identify psychotic, violent or mentally unstable bird species.” You can see some of the images at Flavorwire. There’s a second volume, I Have Heard My Praises Sung In Screams. Gemma Correll and Her Merry Band of Misfits – Blog chock-full of amusing drawings, like New Muses and Disney Princesses, Reimagined. Ghost Photographs – Old photos “improved” by painting ghost costumes on everyone. I am oddly taken with this project.